Jergens Skincare Chronicles 7-Day Challenge + Giveaway! 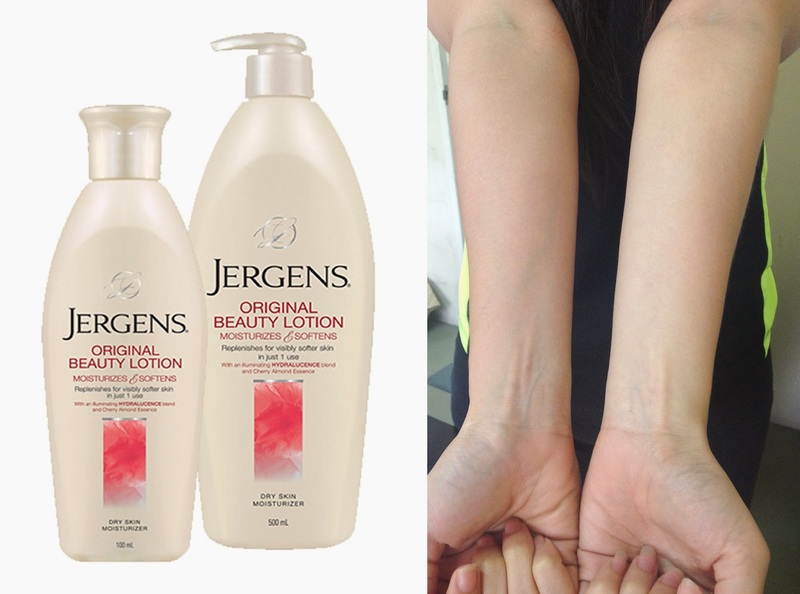 Are you ready to take the Jergens 7-day challenge? Jergens Skincare invites everyone to participate in a one week mission, to test how Jergens SkinCare can make a difference to your skin in just 7 days. I just had to see the results for myself, so.. CHALLENGE ACCEPTED!!! My welcome kit finally arrived to mark the start of my Jergens chronicles. Inside the box are the 'tools' I need to help me with my mission, plus this welcome letter with instructions and mechanics on how to complete the challenge. The 'tools' mentioned were Jergens Skincare products with a matching Jergens coffee/water tumbler. As much as I wanted to test the products, I had to follow the note that says I need to keep it in a safe place first. And keep it I did, with much anticipation on what the succeeding challenges would be..
For your first mission, we want you to radiate beauty from within. Take a bottle of Jergens from your welcome pack and share it with a complete stranger. Tell us why you chose that person and share with us her reaction when she received your gift, and post a photo of her with her Jergens bottle. I was so excited for my first session and immediately thought of someone who I can share the Jergens Soothing Aloe Moisturizer with. Jergens Soothing Aloe Refreshing Moisturiser gives the skin a visibly refreshed and noticeably soothed look and feeling. It's fast-absorbing formula is made with Cucumber Extract and Pure Aloe Vera plus an illuminating Hydralucence™ blend to reveal that natural healthy glow. With the mission title "Radiate Beauty from Within" in mind, I chose Kuya Gary who works for a local courier and attends to some of our deliveries. I thought he can give the Jergens Soothing Aloe to his wife or daughter. A simple act of paying it forward so that he too can radiate beauty from within with Jergens. Original Beauty Lotion Dry Skin Moisturiser reveals a visibly softer skin that lasts all day. It also contains an illuminating Hydralucence™ blend and nourishing hydrators infused with classic Cherry Almond Essence to provides dry skin with long-lasting moisture rich hydration. What made me keep the Jergens Original Beauty Lotion for myself was its Cherry Almond Essence. You can immediately smell a luscious scent of almond and cherry as you apply a small amount to the skin. My skin felt really soft instantly and had this fragrant and sweet floral scent that smells like baby powder. Do you see the difference? I know it's not much but I really love the smell and how it moisturized my skin without the sticky feeling. Water is good for your body and helps keep your skin healthy and looking young as well. Drink only water for today using your Jergens tumbler. Post photos with a time stamp every time you do a refill. I'm almost half way through my mission and I am enjoying every single task. Aside from getting my daily challenge via email, Jergens also sends mission updates via sms. Cool right? So here are the photos of my tumbler refills with timestamps courtesy of InstaTime! This mission may seem so easy, but this was the most challenging so far. It's interesting how this challenge helped me increase my daily water intake. Normally, one liter of water can last me the whole day. But with this mission, I was able to do 8 glasses. Thank you for keeping me hydrated Jergens! Share your blessings, Gain a friend. Host a giveaway and make someone smile today. Choose 1 reader to receive a Jergens gift pack and give the gift of beautiful skin. Don't worry, we'll take care of the delivery. Something's in the mail! We're sending you Cabalen GCs- use them to treat your mom or your fave gal pal to a surprise lunch or dinner. Thank you Jergens for the Cabalen GCs. Instead of treating just my mom, I thought of giving the GCs to my parents, so they can nurture their relationship and have some quality time together. A healthy diet is needed too keep your bodystrong and your skin beautiful. Share with us a family recipe using ingredients that are good for the skin. Here's an easy to do recipe that's definitely healthy and good for the skin. This omelette recipe may seem simple, but the bold flavors of basil, feta and mushroom make it flavorful and tasty. Freshness is the key, so make sure you get the freshest ingredients you can find. Look for an old full body photo of yourself taken in the last 3 months. Then, take a new photo in the exact same pose, this time holding the Jergens variant that you have been using in the past 7 days. Post the photo on your blog. Thank you for taking care of my skin for 7 days Jergens! I'll be sure to continue using it to keep my skin soft and moisturized everyday. Wow.. Lucky you, Congrats. I love Jergens! Leave your complete name and email below. ganda tlaga ng jergens. I used this before but I am currently apply Jergens alternately with the one I;m currently using.